Generations at Regency, in conjunction with the American Red Cross, were very honored to host a community blood donation drive in July. We had an outstanding turnout with many members of the community, family, staff and friends in attendance to donate. Donors were greeted by Regency’s Admissions Director Jennifer Dinkha and given the required paperwork and educational materials regarding blood donation. As they sat in our waiting area, they chatted among themselves about their reasoning for donating blood. For some, they do it numerous times through the year. Others had some personal stories of how blood donation touched close to home for themselves or their families. One of the donors, Shamie Elia, had heard of the blood drive through social media and jumped at the opportunity to donate. 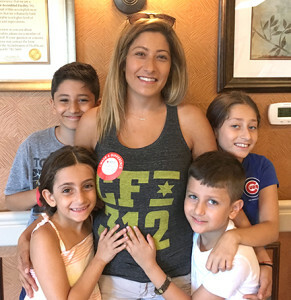 Shamie shared with us her heartwarming story of why she was participating in our blood drive. Back in 2009, she gave birth to her beautiful daughter Lily. After being released from the hospital a couple days later, Shamie, as a new mother, had no worries in the world and was just happy that her beautiful girl was home. A year goes by and Shamie noticed complications with her daughter. Constant doctor visits followed but nothing was resolved. Shamie did everything she could to figure out why these complications were occurring. Lily started having seizures and had MRI scans & blood tests performed. “After we ran tests, the doctor called me and told me to hurry and take her to Children’s Memorial Hospital because her anemia level was at 5.0 and her organs could fail.” After being admitted at the hospital, doctors told her that Lily needed a blood transfusion. Since 2011 Lily has had 3 transfusions in total. On this day, Shamie was donating because she wanted to give back to the wonderful people that donated blood so Lily could have her transfusions. This is her way to thank them and pay it forward. Generations at Regency is ecstatic that Lily is doing well and that Shamie was a donor. After our donors gave blood they relaxed and ate a variety of snacks such as juice, cookies, pretzels and raisins. Eating or drinking foods with sugar helps to keep the donor’s glucose levels up and feel energized after their donation. Our own administrator Lorrie Butler gave a donation as well as other Generations Healthcare Network employees. We could not have done this without the help of our staff, American Red Cross and most importantly the donors. A heartfelt thank you goes out to everyone who attended.